So yesterday I went on a trip London with my mum. 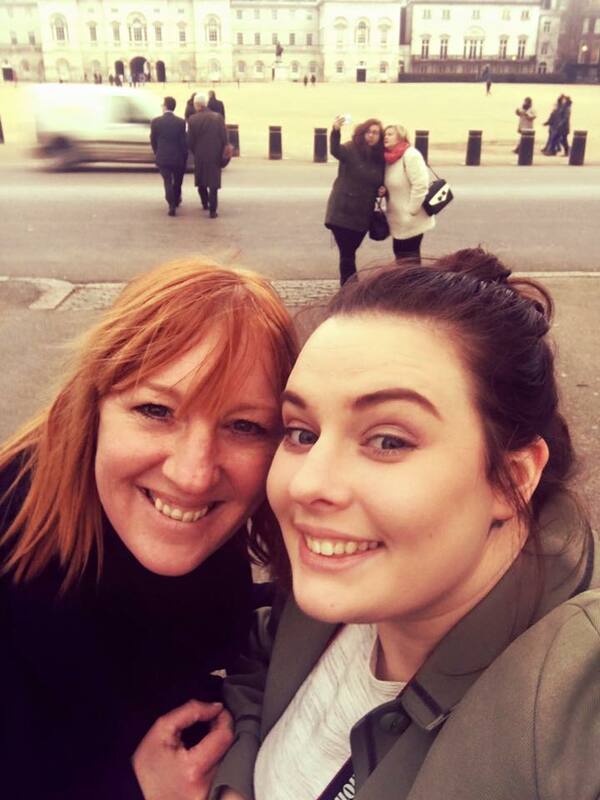 My mum and I see each other once or twice a week minimum, but its usually ALWAYS with Lucas, which isn't a problem at all but, it is nice for some quality mum and daughter time. My mum works at the uni and was able to get me a ticket to the vogue100 exhibition and a seat on the coach. We grabbed a bite to eat in the morning on arrival at 'Garfunkels' and had a wonderful breakfast and a cup of tea. It's a lovely restaurant and the service was super quick which is WONDERFUL! After that was a trip to 'M&M'S WORLD' Brad would never have forgiven me if I didn't purchase him some sort of treat from there! He ended up with some m&m's hot chocolate! Bizarre but looks amazing. I then took a quick trip to "china town" to take some pictures of it all set up ready for chinese new year! There were so many chinese lanterns and it looked really lovely. We then went to a sweet shop to get Brad more sweets! Spoilt little poo. We then headed back to the 'national portrait gallery' for the exhibition, we wandered around and looked at all the iconic vogue covers and all the beautiful photography and the really early issues too. Sadly I wasn't allowed to film or take photos whilst in the exhibition which was rubbish, but rules are rules. Once we finished at the exhibition we headed towards covent garden. My mum purchased me a beautiful cape and top from 'zara' as an early birthday present, so that was really lovely. We had a browse in mac, Charlotte Tilbury, Disney, ect... but my favourite, my all time favourite was 'The Moomin shop!' a place full of everything I could ever want. It's full of beautiful, yet expensive Moomin things. We did only make one purchase though, a VERY cute Moomin cup for Lucas. We then had lunch in 'Patisserie Valerie' and had the BEST afternoon tea for two. Very delicious, very filling and we left feeling very full, sicky and bloated. Then we just strolled, we had about 1hr 30mins left before the coach was departing so we decided to just stroll, browse, and take some photos! Trafalgar square was full of so many pop up tents and things due to them getting ready for the chinese new year celebrations, so struggled to get as many photos of it as i'd have liked. The dinosaur was so cool and who doesn't love a fountain shot ey? We then walked to the guards changing and we were surrounded by lots of police with guns, but it's such a cool place. There were also ducks walking around the park opposite. I love taking photos of scenery, I love taking photos of objects, scenery ect... more than humans, especially little humans called Lucas, that need to now be bribed by chocolate. Going to London yesterday was such a lovely day, i'm so glad I beat my anxiety of London, and terrorists (yeah, I am that person) and went and had a lovely day in London with my mum. My mum and I have always been close and we've always done so much together. I adored spending time with my mum, laughing loads, eating nice food and doing something a little out of the ordinary. By out of the ordinary I mean, going to starbucks, the Disney store and trying to keep Lucas occupied in west quay or primark. Lovely, little days with my mum are the best, I am excited to do it again soon!! You can also watch the vlog here. A little non baby post, so I hope you enjoyed it.